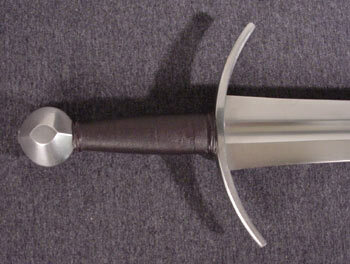 The original sword now resides in the Deutsches Klingenmusem, in Solingen, Germany. 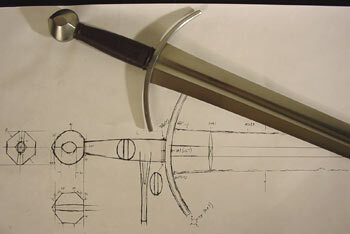 It has a close sibling in the Royal Armouries in Leeds with the same pommel, cross and general blade shape. 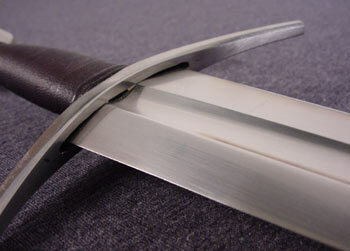 The blade has a form that places it somewhere between type XII and type XIV according to the Oakeshott typology. 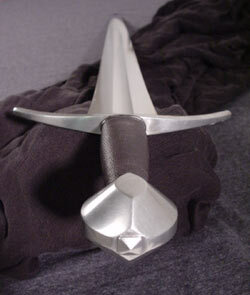 The pronounced point is good for slashing attacks as well as thrusts. The careful distribution of mass in the blade makes the sword very quick and precise in handling while allowing it to cut with authority. Profile and distal taper helps achieve sweet handling characteristics, while at the same time keeping the thin cutting section of the blade stiff. This is a very good example of a weapon where overall shape and aesthetic design are intrinsic parts of the functional aspects of the sword. The master craftsman (or craftsmen) who made this sword sometime in the 13th century shaped the blade and hilt components with subtlety and a deep understanding of volumes and mass distribution. 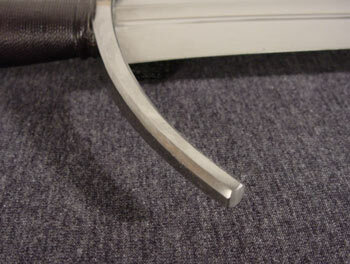 A sword of this type would be perfect for sword-and-buckler fighting and shares many characteristics with the swords depicted in the well known fencing manual I:33. As opposed to the more massive swords-of-war of the time, this responsive weapon excels in performance when put to use with the advanced fencing styles of the period. 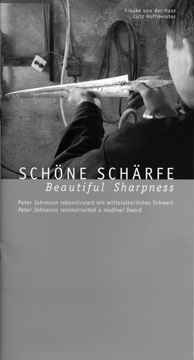 An exact hand-forged reconstruction by Peter Johnsson was on display in the Deutsches Klingenmuseum (Solingen, Germany) in an exhibition on the craft of swordmaking in historical and present times. Experience and information gained during this project is now put to use by the artisans of Albion to make an exact and very authentic recreation that shares the handling and performance characteristics of the historical original. The subtle shape of the pommel is forged and subsequently hand-finished together with the cross to perfectly fit each sword. 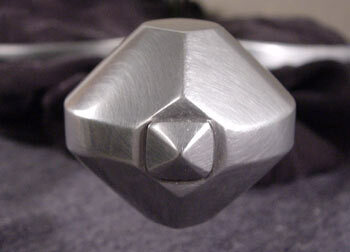 The tang end is peened into the shape of a pyramid and hand-filed and finished to match the pommel. 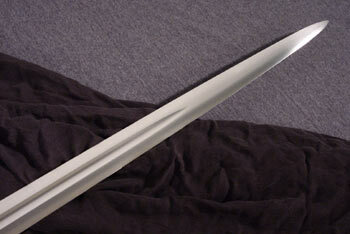 Each sword is individually assembled by the artisans of Albion. 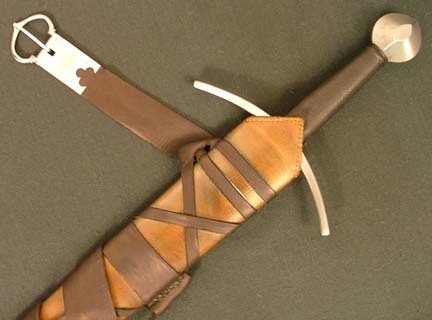 The grip has a wooden core fitted to the stout tang, covered with leather over cord, just as would have been the case with the original historical sword. The blades are hand ground, individually heat treated for maximum flexibility and edge retention, and finally hand finished to a smooth satin finish. The edges are carefully shaped to a beautiful combination of toughness and cutting performance. Read Customer Testimonials about the Solingen here. Read a hands-on review of the Solingen at myArmoury.com here. 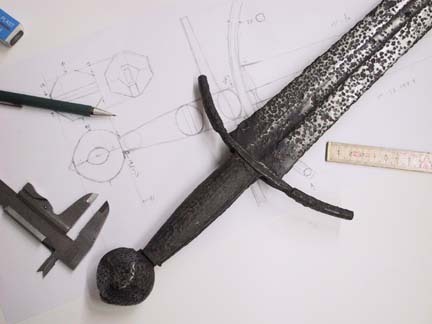 Albion co-sponsored a special exhibit at Deutsches Klingenmuseum in Soligen, Germany, where Peter reconstructed one of the beautiful original swords in their collection. The exhibit ran from April 21 to August 25th, 2002, and proved to be a stunning success. The Catalogue from the exhibit is available (in English) from Albion for $20 (plus postage and handling), with a portion of the proceeds going to the museum. The Catalogue features text in both English and German by Frauke von der Haar, fine photographs by Lutz Hoffmeister of Peter working on the reconstruction, as well as drawings by Peter Johnsson. For more information on the exhibit, visit the Deutsches Klingenmuseum's website.